It is increasingly difficult to satisfy growing demands for spectrum with the conventional policy of fixed spectrum allocation. To overcome this problem, flexible/dynamic spectrum sharing methods that can significantly improve spectrum utilization of the spectrum have gained increasing interest recently. This paper presents two dynamic spectrum sharing approaches, a centralized and a decentralized one. The centralized approach is based on hierarchical trading. Each level of hierarchy is composed of "markets" that are associated with a certain spatial area and trading occurrence frequency, whereas area size and trading occurrence frequency depend on the hierarchy level. The decentralized approach is based on game-theory. There, it is assumed that the operators are averse to unequal payoffs and act unselfishly, enabling a stable and sustainable community. Numerical results show that, in the observed scenario, both proposals outperform the reference case of fixed resource allocation significantly in terms of utilized bandwidth. Whereas, negotiation costs for spectrum brokerage appear in the centralized approach, nonnegligible amounts of spectrum are lost in the decentralized approach due to collisions. Thus, a hybrid of centralized and decentralized approach that exploits the benefits of both is also considered. Radio spectrum assignment and coordination has been under government administration. Licensing to a particular dominant operator for a long period has been the traditional method for spectrum assignment in order to avoid interference and collisions. This assignment method reduces the risk associated with spectrum acquisition so that relatively large investments of capital expenditure (CAPEX) can be made to develop wide area wireless communication services, which may take a relatively long time to become stable and to establish profitable businesses. On the other hand, timely spectrum allocation for new wireless network development is necessary to deal with increasing market demand. However, since existing wireless networks occupy extensive parts of the available radio spectrum, there is insufficient spectrum available to all new wireless networks. Thus, various regulatory bodies consider possibilities to address this problem via shared use of spectrum. For example, in the USA FCC [1–3] considers to allow sharing of unused portions of TV band [4–6], in Europe a comprehensive study for the European Commission on conditions and options in secondary spectrum trading is done , and in Japan the government implemented a frequency band on a registration basis (4.9 GHz–5.0 GHz) to promote shared use of spectrum . One promising technology to enable spectrum sharing and alleviate the problem of insufficient spectrum is Mitola's concept of "cognitive radio" , a radio which senses its environment and dynamically adapts to it. Generally speaking, there are two control concepts for dynamic spectrum access in cognitive radio systems: a centralized and a decentralized one. In this paper, auctioning protocols for centralized control and protocols based on game-theory for decentralized control are discussed and novel control algorithms are proposed to improve the overall spectrum usage. In contrast to existing real-time spectrum allocation approaches [10–14], our centralized model with hierarchic trading between service providers (operators) combines the short-term flexibility over small geographical areas, for reacting to current traffic demands, with a long-term reliability over large geographical areas for the operators. Resources once acquired on a certain hierarchical level are in possession of that respective operator for a specific time unless he decides to rent them on more granular hierarchical levels in a shorter term auction. In this way, the operator can rent, on short-term basis, resources that are temporally obsolete for him and automatically regain and continue using them after the renting period ends. Also, from a system-wide perspective, due to the short-term adaptation to actual demand, the overall spectrum usage can be improved, as resources allocated to an operator who does not need them can be sold to another operator facing a momentary shortage in resources. Regarding the decentralized approach, the "inequality aversion model" described in  based on social anthropological studies is studied in this paper. In , a decentralized algorithm based on this model to control intersystem fairness between two wireless systems is proposed. This model, however, does not take into account the overall throughput performance so that in the worst case, the payoff for all operators equals zero. In order to avoid such a situation, we propose a policy for improving the overall throughput within the shared spectrum. Negotiation costs for spectrum brokerage are needed in the spectrum trading for efficient and flexible spectrum sharing, whereas nonnegligible amounts of spectrum are lost due to collisions in the decentralized spectrum sharing approach. Thus, a hybrid between centralized and decentralized approach is proposed that trades off negotiation costs against spectrum loss caused by each of the individual approaches. Employment of this control results in a reasonable overall throughput performance with lower negotiation costs compared to those of the centralized approach. The rest of the paper is organized as follows. In Section 2, the spectrum sharing approaches are classified. In Section 3, the spectrum trading resource allocation assuming a centralized resource allocation entity is considered. The conventional and the proposed game theoretical approach for resource allocation in decentralized spectrum sharing systems are presented in Section 4. In Section 5, numerical simulations are used to illustrate the benefits of the considered resource allocation methods. Finally, conclusions are given in Section 6. The existing approaches for spectrum sharing can be classified according to spectrum access priority and architecture assumption. In the following, we give more details about each of these two criteria. Considering access priority, two general scenarios can be distinguished; vertical sharing (VS) where the spectrum of the systems is shared at different priority levels, for example, in the spectrum pooling approach , and horizontal sharing (HS) where the spectrum of the systems is shared with equal priority, for example, in wireless local area networks (WLAN). A regulatory policy for VS deals with protection criteria and their application to an existing or a new system to avoid interference from and to other systems. For instance, radar systems in the 5-GHz band are protected from interference caused by WLAN devices by a regulation that stipulates the implementation of a detection and avoidance mechanism, for example, dynamic frequency selection (DFS) into WLAN devices . Other examples include the detection of broadcast transmissions by other communication devices to allow them to operate in the spectrum prioritized by the broadcast services when it is locally and temporally not in use by the highest priority device . HS deals with methods for the spectrum sharing of wireless systems with equal priority. Some license exempt bands such as ISM bands represent HS scenarios. Problems such as how to construct a sustainable and efficient spectrum sharing environment with minimum regulation are studied, for example, by applying game theoretic approaches  or by allowing trading licenses between existing service providers . This contribution focuses on the HS spectrum sharing scenario. Spectrum sharing can also be classified based on architecture assumptions, we distinguish centralized and decentralized sharing. In centralized spectrum sharing, a centralized entity controls the spectrum allocation and access procedures. Each entity in the shared spectrum forwards its status, such as traffic demand in the spectral and temporal domains, to the central entity and this entity allocates the shared spectrum among entities considering the spectral efficiency and fairness among entities. In decentralized spectrum sharing, carrier sense multiple access with collision avoidance (CSMA/CA) protocols and game-theory-based distributed decision making protocols have been studied in [19, 20]. In these studies, each entity is responsible for its spectrum use and its spectrum access is based on local or possibly global policies. The goal of these studies is to find minimum policy sets for flexible, scalable, and sustainable shared spectrum use, depending on the growth of market demand and the amount of traffic. A future spectrum sharing system could exploit both architectures, for example, centralized over larger geographical areas and decentralized architecture in local area deployments. Besides technical and physical considerations, transmission rights often have a monetary value for the users. As can be seen in the example of allocation of Universal Mobile Telecommunications System (UMTS) frequency bands in Germany, operators invested heavily to acquire the licenses . These licenses were auctioned by the regulating authority. Auctions are a known economic instrument for selling, that is, allocating goods and simultaneously determining the price based on the bids of potential buyers. In the case of the German UMTS licenses, auctions took place once, allocation is static for next 20 years, and no resales of acquired spectrum are allowed. However, auctions may occur in different levels of radio resource allocation, as described in related research publications summarized below. In wired networks, for example, by using the resource auction multiple access (RAMA) protocol , network nodes place random numbers as bids, from which the highest number will determine the node allowed to use the resource in the following frame. However, bids do not refer to any pricing information. By adding this economic aspect, real-time auctions could be used to combine resource allocation and pricing. In , real-time auctions between service providers and users are proposed in which users compete for available resources at every time slot, that is, on a short-term basis such as seconds or milliseconds. The auction is held by the service provider, who is allowed to set a reserved price to ensure a minimum gain. The calculation of bids is performed dynamically by the users' cognitive radio terminals. If the cognitive radios are multistandard nodes, they can take part in auctions for different access points using different radio access technologies. In this way, the cognitive radio will try to maximize the user's utility by maximizing the quality of services (QoS) at the lowest price possible. The drawback of this auctioning procedure is that it cannot give any QoS guarantee to the nodes as in each time slot another cognitive radio could place a higher bid than an active user and interrupt that user transmission. In , auctions on the interoperator level are introduced. Since the long-term planning of operators must consider peak traffic demand in business hours, parts of the resources remain idle over the day. Hence, operators owning base stations in overlapping service areas can rent unused channels. As in the spectrum pooling  approach,  considers OFDM based radio access, in which one OFDM carrier can serve as an atomic auctionable item for a certain time slot length thanks to inherent flexibility of OFDM in the time and frequency domains. A spectrum auctioning system based on the assumption that an interference temperature constraint applies at a certain measurement point is discussed in . A central spectrum manager is in operation, but the user nodes do not trade bandwidth as a resource. Instead, they are charged either for the received signal to interference and noise power ratio (SINR) or for their allowed transmit power. In current spectrum allocation practice, the resources within the frequency range of a communication system are allocated once by the regulating authority. Once these allocations are made they are fixed on a long-term basis. Of course, in this way operators can rely on the available frequency channels and hence they are able to plan and establish their infrastructure. This will include frequency planning to avoid intercell interference. As a consequence, reacting to varying, especially increasing, traffic demand is only possible on a longer time basis, as replanning for certain areas becomes necessary and may include the establishment of new base station equipment. The licenses guarantee the operators exclusive use of respective frequencies, so that interferences from other service providers are excluded since violating license constraints is not favorable for any operator. second, after outlining the advantages and drawbacks of a two-step hierarchy model we extend it to a hierarchical spectrum trading concept with an arbitrary number of levels, where countrywide and cell-specific hierarchy are the coarsest/highest and the most granular/lowest hierarchy, respectively. In the concept of two-level hierarchy, we start from a given spectrum allocation. Then by trading, this initial allocation is adapted on cell level and the new allocation is valid for the duration of one short-term time frame. Thereafter, a new trading period will determine another adapted cell-specific allocation, but starting again from the given allocation that was used as starting point in the previous trading periods as well. So the initial allocation is guaranteed and any operator who is temporarily not willing to take part in trading is not obliged to do so. In that case, he can rely on the initial allocation and is not affected by the trading operations on the short-term scale. In this short-term time scale, the estimation of required resources can be very accurate. To meet the best traffic estimation, the auctions for resources are conducted immediately before the actual transmissions. It is hard to give specific values for the duration of the mentioned short-term trading periods. In an implementation of such a trading system, many parameters have to be taken into account, for example, average connection times in the underlying communication system, the inherent framing structure, stochastic traffic parameters, and so forth. Hence, in order to facilitate examples in this paper, we will talk about short-term periods in the range of some minutes, without claiming to give any directly implementable values for a certain system. By means of this short-term trading, the preallocated resources can be accurately adapted to the actual demand situation on the cell level. However, the further into the future a given trading period lies, the more uncertain the estimation becomes. Operators can only make rough, averaged estimations, including recurrent variations over a day, and generic corrections, for example, before upcoming events with presumably higher traffic demand. However, if an operator expects a high traffic period for a longer time than one elementary trading period, he may desire to acquire more transmission resources in advance for that longer period and not just before each short trading period. This is important to the operator, as he may desire to supply a certain quality of service to his customers. This can only be assured if the operator knows that he gets additionally acquired licenses for a sufficient time. However, in the way discussed up to here, operators still face some uncertainty about their allocation in future time frames. After each frame, allocation is reverted to the initial allocation and an operator cannot be sure to acquire a certain number of additional resources again for the upcoming frame which he perhaps had acquired for the current frame. Here, we see two contradicting goals of allocation: on the one hand, the reliability of long-term fixed allocation that allows the operator to plan into the future and to offer quality of service levels to his customers. On the other hand, flexible short-term adaptation will enable reactions to current traffic variations and a higher efficiency in resource usage. Hence, we are going to propose a trading framework which will provide operators with a reliable allocation at every time instant as well as it will enable the adaptation of this allocation on several resolution levels both in time and spatial dimension. We propose a concept with several hierarchic market levels of different granularities in time and spatial direction. The top and bottom levels are defined by the discussion up to this point. The current allocation done by the regulating bodies, that is, the status quo, has the coarsest time and spatial resolution and will form the highest level in our model. The time scales encompass years and the allocation is fixed usually countrywide. At the other end of the hierarchy, the lowest, that is, most granular, level is given by the elementary short-term frames. For the spatial component, at the lowest scale, we use the natural definition of given cells. As an assumption for this model, the coverage of cells by different operators is required to be nearly the same. This ensures the unproblematic exchange of transmission channels between operators in a given location without causing interference issues or the need to do exhaustive and nontrivial frequency planning. In this way, one common cell represents an elementary market place for spectrum trading at the lowest level. Having the lowest, most granular level, and the highest, that is, coarsest, level defined, we are now able to fill the gap between these two scales and describe the concept of hierarchical spectrum trading with an arbitrary number of levels. In the following, frequency resource goods, that is, licenses to transmit on a certain frequency, are abstractly seen as a unit within one temporal elementary trading period. An important assumption is that within this trading period and within one cell, the goods are fully interchangeable and, after the trading period, only the number of goods each operator possesses is of interest. This will allow transactions between arbitrary number of bidders and buyers in a trading period and enables cell independency of certain physical constraints. So starting from the lowest level, we can define the next higher level by grouping trading resources of the lowest level together. 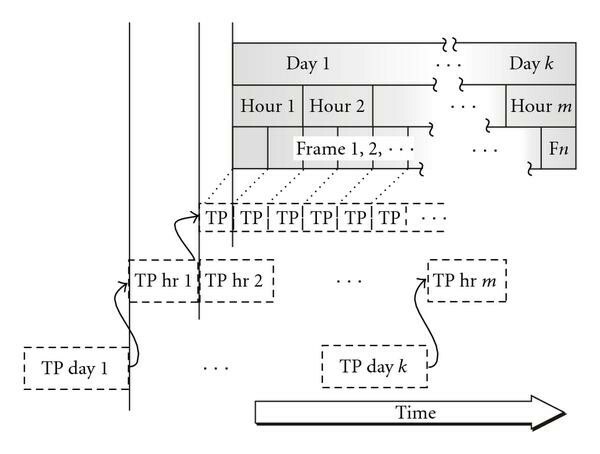 The principle is shown by an example in Figure 1 for the grouping of frames into hours and days, considering only the time dimension at the moment. Below the frames, we see the timing of trading periods for the respective transmission periods. In this example, before a day starts, there is an auction which will allow the operators to trade the resources for that upcoming day. A trading resource represents a plethora of grouped elementary transmission resources. This means that acquiring one more resource on the day level would allow the operator to use one more transmission resource in each elementary time frame of that day compared to the next higher level allocation given by the regulator. However, directly after the auction on the day level, the grouped bunch of resources is split in time and spatial dimension. The resulting finer parts each independently "enter" the next, respectively, more granular, level of trading. That is, from one bunch of resources traded at once for the day, smaller parts for consecutive time frames, for example, for each hour of that day, and different smaller regions result. In the example here, the next level is the hour level. So there will be an auction before each hour of that day, each of which will start with the allocation outcome of the day level. The same procedure repeats after the auction for the hour level. Resources auctioned in a group of one hour are split and might be traded again independently of each other on the bottom, per time-frame level. Finally, after each trade on the bottom level, the allocation is translated to a physical allocation of, for example, frequency channels. 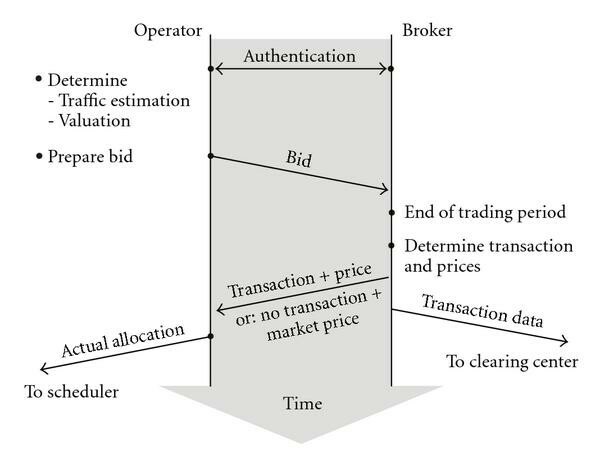 As it can be further seen in Figure 1, auctions are held as short before the respective period as possible to meet best traffic estimations. Diagram showing hierarchically organized timescales of trading periods (TP). For clarity, only grouping in time direction is shown while spatial grouping is omitted. At the same time with grouping frames on the time scale, while ascending in the market hierarchy, neighboring cells with presumably similar traffic profiles can be grouped to let the markets with lower time granularity also have a coarser spatial resolution. In this way, local markets with short-term allocations are grouped into regional markets with longer-term allocations. At the top level, as stated above, there is the status quo of country-wide allocation lasting for several years. Auctions are economic means to determine the value of an arbitrary trading resource and to allocate the goods at the same time. This is interesting especially in cases where an absolute value for an item is not given. In the case of auctions, the actual trading price is dependent on the bids and asks of the involved traders. By changing the situation from "one seller/multiple buyers" in well-known auctions, for example, for art objects, to "multiple sellers/multiple buyers," a situation arises that can be found most notably in stock exchanges. The stocks of companies as well as shares in investment funds and many other divisible goods such as commodities or even carbon dioxide emission rights are traded around the clock and all over the world. Having this in mind, trades can be made in quasi real-time and current prices can be updated in intervals as short as minutes. In typical stock exchange situations there are two sides of the market, the selling and the buying side, with one or more participants and the price determination mechanism is called double-sided auction or double auction for short. Similar preconditions exist in the case of mobile service operators trading equal, elementary radio resource goods within hierarchical trading periods. As each operator can be a buyer or seller, dependent on current demand estimations, double auctions are naturally used as the trading and pricing mechanism in spectrum allocation auctions. Furthermore, double auctions can be held in two forms: continuous and discontinuous. Continuous auctions are characterized by asynchronously arriving bids with regular price updates, whereas discontinuous auctions are characterized by the collection of all bids with a one time market clearing in the end. The continuous auction form is that used in stock exchanges. While the stock exchange is open for trading, participants may place their bids, that is "orders," for a certain stock. In the case, a newly arriving order matches existing outstanding orders, a transaction will immediately occur. In consequence, the newly formed price has to be announced to all market participants. And of course, each participant is allowed to place an arbitrary number of orders during a trading day and naturally on every day that specific stock is traded. For shares, these can be decades for which a company is listed. Comparing this to the situation in resource trading, we could identify transmission resources for a certain market level, market location, and transmission period as a different stock. However, we assume traffic estimations to be most accurate immediately before the actual transmission time. But only when demand can be reliably estimated, a possible price for bidding can be evaluated by the operators. Hence, it is not favorable to trade transmission rights lying far in the future for a long market opening continuously. This goes hand in hand with the signaling overhead. Buying and selling short-term local resources in a long-term open market causes an unacceptable high signaling effort that is not deterministic, as resources may repeatedly be bought and sold again and again even by the same operators. As stated before, it is desirable to have the auctions as short before actual transmission frames as possible. It does not make much sense to have an open market for the resources of certain, perhaps fine-granular, frame which is of longer duration than the transmission frame itself since accurate traffic estimations and thus reasonable bidding are only possible in the very short time before a frame starts. In our model, longer-term traffic estimations are addressed by the higher hierarchies of hierarchical spectrum trading concept. For these reasons, we consider the continuous auction model as inappropriate for the hierarchic framework proposed in this work and in the following, we describe a discontinuous double auction protocol. For each trading frame, each operator sends his bid exactly once. After all bids are collected, the resulting transactions are signaled only once to all participants. In this way, the number of messages to be exchanged is deterministic and signaling is efficient. Furthermore, the order in which bids and asks arrive is unimportant as it would be in the continuous case. Altogether, this enables the auctions to be held even in the time-critical time scale of the most granular market level. In this paper, a special form of discontinuous double auction, the McAfee double auction protocol , is exemplarily exploited for trading of spectral resources. With McAfee protocol operators' strategy that maximizes own benefit is to send real, that is, "honest," valuations in auction messages. In other words, with "honest" reporting of valuations equilibrium is reached in McAfee protocol. This property is achieved by sometimes charging buyers a higher price than sellers receive and by prohibiting that the least profitable trade happens in the event when buyers are charged more than sellers. The broker receives the gains that occur in such cases. Proposed hierarchical spectrum trading concept is not limited to application of McAfee protocol and could be combined with other price formation rules for discontinuous sealed-bid auctions, some of which are described for example, in . In the following, we describe the application of McAfee protocol to the considered spectrum trading concept. For the purpose of collecting bids from the operators, in each market level and area a dedicated logical broker is in operation. The brokers are software agents. During the trading periods, they only have to communicate with the trading software agents for the operators that deal with the traffic demands in that specific cell, whereas at the end of the day, they must transmit clearing information to a centralized organization. So, at the local level, these software agents can function in a distributed manner on hardware physically collocated to the cell in order to minimize possible latencies in the signaling procedure. Equivalently, the operator agents can have local instances to deal with the short-term variations in traffic, whereas regional or overall traffic trading is planned and organized in a more centralized way. The local hardware resources can either be provided by one of the operators or by the regulating authority. In both cases, costs can be balanced by fees for the operators, for example, based on trading volume. Figure 2 shows an example constellation, this time the spatial partitioning of the market into three levels is used as example. The broker instances of the "local" level, corresponding to the most granular short-term bottom market level, conduct auctions for single cells. On the regional level, multiple cells are grouped and the respective regional brokers are in action on the longer-term basis. So the outcomes of auction on the "regional" level are passed down to the corresponding "local" brokers, which use them as the starting point for their auctions. Diagram showing relation between operators and brokers. The instances of regional brokers (BR) and local brokers (BL) are located in the respective areas in a decentralized manner. Thereby, the resource allocation R results from the outcome of trading on the next higher, that is, coarser market level. For a positive , the operator acts as a buyer, and for a negative he acts as a seller. In any case, the operator establishes a connection to the respective dedicated broker via the backbone network. The operator identifies itself and sends a market identification comprising market level, market area, and trading period. In this way, it is unambiguously identified which market the operator wants to participate in and which are the resources that can be traded. Diagram showing the basic signaling procedure for a trading period between one operator and the broker. As they offer paid radio services to their customers, operators can assign a value to the transmission right at a specific time. This valuation depends on different factors, varying both in time and by operator, for example, basic operating costs, time-dependent traffic demand caused by the customers, and pricing with respect to these, and so forth. Based on these factors and considering the actual market level, the operator valuation for one trading good, V, is calculated by each operator. It is assumed that this value is assigned equally to all goods of the current market level and location. So, the maximum price an operator is willing to pay for additional resources in the case of is directly given by V. By acquiring resources for a price of , the difference, , remains as an extra surplus for the operator. Conversely, when selling resources that are presumably not used, the transaction price directly remains as a gain for the operator compared to holding but not consuming the resource. So there are n asks and m bids, where represents the i th lowest ask and the i th highest bid of the generated bid and ask lists. Note that the broker keeps track of operator's identifications O associated to the specific bids and asks. In the case that , no transaction can be made and the auction immediately ends. Otherwise, transacting parties must be found. For easier formulation, is defined as the (fictitious) highest possible ask and is the lowest possible bid. In the case that the bids or asks from different operators are equal in price, the order within the list is randomized. If is in the interval , all asks and bids result in a transaction at price . In the other case, where , only asks and bids result in a transaction. Furthermore, the transaction price is different for buyers and sellers, and , whereas the difference of is kept by the broker, which acts as a "budget balancer." If "honest" valuation of resources is not of the highest priority for participating operators, they could agree on other double discontinuous auction type that does not include payments to the broker. Note that for all higher market levels, this information is sufficient for the operators, as in these stages, the mapping of abstract resources to physical resources is not necessary. Nevertheless, the broker will maintain a history of transactions for clearing purposes. However, on the lowest market level, the level with finest granularity, a common resource scheduler needs to know the final allocation of transmission resources for the upcoming time frame in order to accomplish the allocation of specific physical resources. Being a software agent, the scheduler is collocated with the broker, since it has to serve the same operators for the same cell as the broker. This collocation also mitigates explicit signaling between the broker and scheduler. The scheduler signalizes the channel numbers added or lost to each operator after a successful transaction. That scheduler can be designed to accomplish different goals. One possibility is to implement an algorithm that tries to reallocate those frequencies first, which were last allocated, so that a minimum of reconfiguration becomes necessary. Another possibility is to randomize reallocations. This would mitigate the effect of benefitting any operator with respect to channel quality, for example, concerning actual fading and interference situation. Nevertheless, note that a basic assumption of our approach is the complete interchangeability of resource goods in order to allow efficient trading by a double auction scheme. Consequently, it is not possible for an operator to bid for a specific frequency channel, even on the lowest market level, for example, to have a contiguous frequency block after the auction. Compared to the current fixed allocation practice, this is not a disadvantage for operators, as by not participating in any trades, the allocation status quo for that operator would not change. With respect to interference and reliability, nothing changes from the current situation by applying the trading approach. As the trading model is a system commonly incorporated by all operators, they all will adhere to the licenses both before and after trades as they did in conventional allocation situation. None of the operators would just use frequencies for which no license is present, same as today operators do not just occupy another operator's resources. In summary, our presented approach combines the long-term reliability of conventional frequency allocation by the regulating bodies with the flexibility of short-term resource trading. By applying a hierarchic model in time and spatial dimension, refinement of allocation can be applied in a more and more decentralized matter, that is, the lower in the market hierarchy one gets. The focus in this section is on the game theoretical framework for decentralized spectrum sharing. This framework is flexible enough to investigate the shared spectrum usage not only from the micropoint of view, for example, how each operator behaves and how much payoff it gains based on its own interest, but also from the macropoint of view, for example, ensuring stability of the spectrum sharing. Game-theory provides a mathematical basis for the analysis of interactive decision-making processes. It provides tools for predicting what will happen when agents with conflicting interests interact . A game consists of three basic components: a set of players, a set of actions, and a set of preferences. Furthermore, it incorporates two basic assumptions: first, the rationality assumption, that is, the players are rational so that they always choose strategies that maximize their individual expected payoffs. And second, the common knowledge assumption, that is, the specification of the game, including at least the players set, the players' action sets, and the definitions of their preference relationship, are common knowledge in the game. These assumptions enable players to anticipate others' strategies in the game. In the spectrum sharing scenarios, these assumptions can be implemented as common policy rules which all players joining a spectrum sharing game have to follow, whereas administration or the monitoring of the shared spectrum use is done by a spectrum manager. In this contribution, the players are wireless operators that share spectrum and make decisions about acquiring the spectrum for their signal transmissions. It is also assumed that each operator has a player set, that is, each operator knows which operators are joining the spectrum sharing game. This assumption sounds reasonable as the shared spectrum is available only for registered users and lists of the registered operators are available, which is similar to the Japanese registered frequency band . Concerning the action set, for example, controls of modulation scheme, coding rate, or transmit power level can be taken as the players' (operators') actions for the appropriate shared spectrum use in wireless systems. In this paper, a transmit probability control is assumed as the operators' action set. Regarding the common knowledge assumptions, it is assumed that the operators are synchronized for their spectrum sharing game so that they have a common definition of shared spectrum goods to easily compare their own payoff with that of the others. When the players actually act, the outcome of the game is derived from a preference relationship for each player. Generally, the preference relationship is represented as a utility function that assigns a value to each possible outcome. Hereby, higher utilities represent more desirable outcomes. In wireless communications, a player might prefer outcomes that lead to higher signal-to-noise level ratios, lower bit error rates, more bandwidth availability, more robust network connectivity, and lower power consumption, although in many practical situations these goals will be in conflict. Some cooperation mechanisms among players are needed to minimize conflicts of their signal transmissions in the decentralized shared spectrum use. If noncooperative behavior is allowed, all players try to maximize their individual payoffs by increasing their transmission probabilities, resulting in frequent signal collisions among players; preventing them from acquiring any payoffs at worst. For instance, IEEE 80 211 applies some rules for signal transmission such as the listen before talk protocol and random back off control in order to provide equal signal transmit opportunity to all operators, resulting in the establishment of stable and effective shared spectrum usage. where is the utility of the i th operator, and and ( ) indicate the payoff for the i th and j th operators, respectively. Payoffs are numbers which represent the motivations of players, such as their profit, quantity, or other continuous measures. In this paper, the payoffs indicate the amount of spectrum used for their signal transmissions. Term n is the number of operators sharing the spectrum. is the priority level of i th operator among all operators for payoff. When some operators have priorities over other operators for payoff, their payoffs in (9) are discounted according to their priority level. Also and indicate the reacting factor of the i th operator against other operators who receive a higher payoff and against operators who receive lower payoffs, respectively. Since utility functions express the operator satisfaction level, each operator behaves to maximize his own utility function independently. Based on an anthropological study , it is also shown that a sustainable community where each operator receives the same payoff can be established by setting . This parameter setting model of the operators' preference when his payoff is less than that of the other operators is different from that when his payoff is more than that of the other operators. In , operators and payoffs are referred to as wireless operators and transmission time (airtime), respectively, for controlling intersystem fairness based on the inequality aversion model. 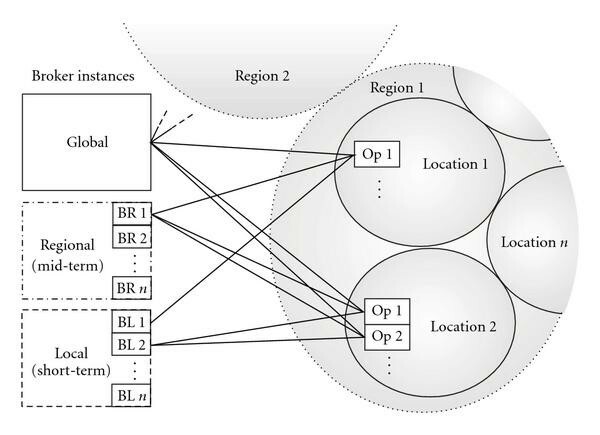 In this paper, it is assumed that all operators can exchange their payoff values and the priority levels by the information exchange via a backbone network connected to all operators. It is also possible for each operator to measure his payoff individually by monitoring all transmitted signals from users and by detecting to which operators the users belong by using signal headers which include IDs of their affiliations. However, this conventional policy does not take the overall throughput performance into consideration so that a situation may result where all operators have equal zero payoffs, which is the worst case from the spectrum availability point of view. In order to avoid such problems, we propose an improvement to existing inequality aversion model: a policy in which each operator considers the overall status of the shared spectrum usage for calculation of its utility function. where is the total amount of shared spectrum, indicates the amount of unused spectrum measured by the i th operator, is the amount of spectrum loss caused by signal collisions, and γ reflects the sensitivity for the spectrum loss over the unused spectrum. Ideally these values are common for all operators but they may be different for each operator due to their measuring errors when assuming each operator measures individually the values of , , and by sensing their surrounding radio environment. The coefficient decreases according to an increase in the amount of spectrum loss and increases according to an increase in the amount of unused spectrum. By weighting the utility function from (9) by , operators act more actively to get their payoff when there is a relatively large amount of unused spectrum and more passively when there is a relatively large amount of spectrum loss. This adjustment enables operators to behave independently while considering both multilevel fairness and overall throughput maximization. where and indicates a discounting factor according to priority level of i th operator, and is the traffic demand for the i th operator. By controlling the transmit probability of each operator based on the above equations, the policies on spectrum sharing can reflect the behavior of each operator. In this section, numerical results obtained through computer simulations are presented. To evaluate the feasibility of the described spectrum trading approach introduced in this contribution, simulations were conducted considering trading in one cell. In the cell, 100 channels are assumed to be available as trading goods. "Level 0" (L0) refers to the lowest and most granular level in market hierarchy, that is, it represents the short-term case. Several trading periods of L0 are grouped to form a trading period of "Level 1" (L1) which represents the long-term case. "Level 2" (L2) is seen as the static case and its allocation can be seen as given by the regulator. In the simulations presented here, available channels, that is, trading goods, are equally distributed among the operators at the highest level L2, allowing a difference of one resource between operators to exactly match the sum of 100 channels. The resource demand modelled on L0 is the actual demand the operators are facing and trying to satisfy via spectrum trading. The demand on a higher level L1 is equal to the mean demand over several L0 trading periods that compose the L1 market. In this way, from the L1 perspective, the operators are aiming to satisfy their prospective average need for resources and finer resource adjustments happen on L0. To evaluate resource usage later, only actual demand (L0) will be compared to the resource allocations of the static case (L2) and the allocations after the trading processes on L1 and L0. In our simulation scenario, eight operators are competing for the transmission resources. In each simulation round, one trading period on L1 is conducted. Afterwards, the outcome is passed down to 40 L0 trades. In order to model traffic variations on the short-term level L0, demand of each operator is changed from one trading period to the next by means of a random walk. That is, the demand is with equal probabilities increased or decreased by 1 unit, not going below 0 units and not exceeding 100. The start value of the random walk process is the demand drawn for L1. Thus, the mean of the resulting statistical process on L0 remains the same as the demand chosen for L1. Variations in traffic demand according to the random walk process are illustrated by an example in Figure 4 for one simulation period, that is, for 40 L0 trading periods. For clarity, only arbitrary three out of eight operators are shown. The starting point on the left side of the figure is the demand on L1. Illustrating the random walk traffic model for arbitrary three out of eight operators. Whereas the random walk model on L0 aims at modelling dependencies of demands in the short-term case, a well-known assumption for packet-based traffic of independent sources is to follow the Poisson distribution. So for L1 traffic modelling, we chose independent but equally parameterized Poisson processes to draw L1 demands for each operator and simulation round. The Poisson distributions mean parameter λ is chosen so that the overall demand as the sum of operators' demands as a parameter of the simulation is met in the interval of 40, …, 200 resources. Finally, for each simulation, the price V, which an operator is willing to pay for a trading resource, is drawn from a discrete uniform distribution. Each operator draws the values independently from the interval [1, …, 100] once per simulation round. For system-wide comparison of efficient resource usage, the overall number of actually used resources is determined using the static allocation (L2) and the allocations achieved after trading both on levels L1 and L0. So each operator used as much resources as possible within the respective allocation, but not more than given by the traffic demand modelled on L0. The resource usage is shown relative to the maximal value of 100 resources. 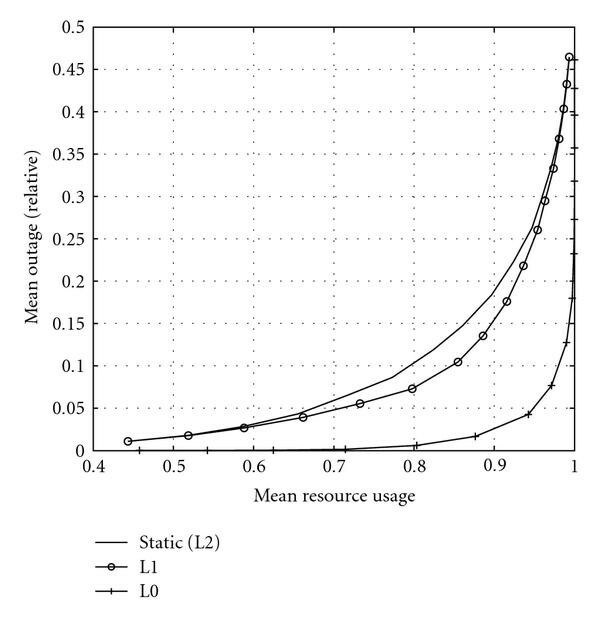 In the complete range of simulated system load, an increase in system-wide efficiency by resource trading can be observed in Figure 5. Overall resource usage at different market levels of the centralized spectrum trading approach. Furthermore, it is shown that by short-term adapting the allocation on L0, the allocation accomplished on L1 can further be improved, as actual traffic can be considered and not only the mean estimate of L1 is used. The maximum efficiency increase in this simulation from fixed allocation to short-term trading can be observed to be up to 11.8 percentage points at an overall demand of 100 resources in this scenario. As a second figure of merit, the mean relative outage per operator is studied to account for the operator-centric view of the trading process. Outage occurs when the final resource allocation for an operator is less than actual traffic demand. That means, that traffic has to be dismissed, or vice versa, additional resources could have been used if they had been acquired before. The absolute outage is the number of resources needed but not acquired. 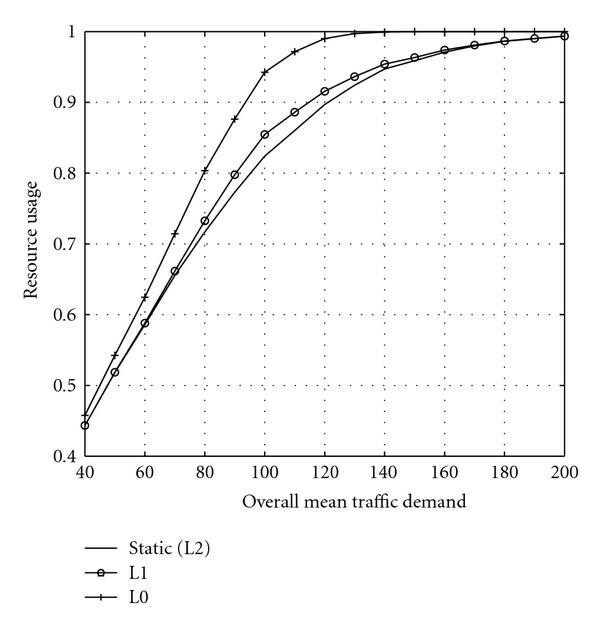 To make figures comparable for different demand situations, the outage is given relative to the actual traffic demand of the respective operator. In Figure 6, relative outage is plotted for the given scenario against the overall usage of resources as they can be found in Figure 5. So for example, at a fixed given outage of 5% at the operator level, we can observe the system-wide resource usage to increase significantly about 41%. Operator-centric outage measure plotted against the mean resource usage found in Figure 5. The general setting such as the number of resource channels and operators, and the settings of trading levels and traffic models is the same as for the evaluations of centralized approach. In the following, assumptions specific for evaluations of the decentralized spectrum sharing approach are described. They are basically the same as in  except that signal collision status is taken into account. In the decentralized approach, it is not possible to allocate the spectrum resources to the operators in the L2 market level because there is no negotiation protocol for the resource allocation prior to starting the spectrum sharing game. The traffic demand estimation in the market L2 used for the calculation of weights of the decentralized approach is defined as the mean value of the traffic demand in L1 market level for each operator, instead of the L2 auction of the centralized approach. Transmission packet size is the same for all users and their transmission timings are slotted and synchronized ideally, like a slotted ALOHA. 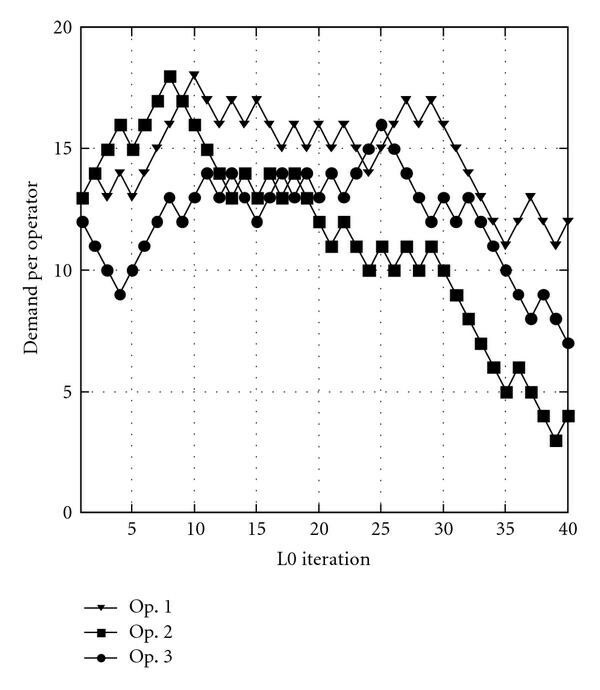 The implementation complexity for the synchronization in L0, L1, and L2 is different depending on their control granularity. For example, L0 needs the tightest synchronization so that the complexity is the highest among them. For simplicity reasons, in the evaluations, it is assumed that all levels of control are implemented ideally so that synchronization errors do not occur. Each operator accesses all channels with the same transmit probability at the same time. Note that the initial transmit probabilities are set to 1. Each operator has a unique ID included within their transmission signals. Operators can sense the IDs so that they can measure the traffic demand for i th operator via spectrum sensing. Carrier sensing works ideally and no hidden terminal is present. Also, sensing error caused by propagation time difference and by switching time lag from sensing mode to signal transmit mode is small enough to neglect. Parameters α and β are set to 1.0, 0.01, respectively, which are heuristically selected so that the best performance can be achieved for the conventional policy with L0 control. Also, parameter γ is set to 0.9, which is selected for the best performance of the proposed policy with and . Discounting factor is set to 1 for all operators. In (14), n is the number of operators, is the throughput for the i th operator, and is the weight for the i th operator which is set according to the operators' traffic demand. The closer to one FI is, the fairer the spectrum sharing is. As a reference, the conventional policy, described in Section 4.2, which deals with only interoperator fairness is used in the subsequent simulations. Figure 7 shows the performance of overall resource usage. Similar to the centralized approach, it can be seen that the more granular the control level is, higher the overall throughput performance is for both the conventional and proposed policy rules. Also, the proposed policy exhibits higher overall throughput performance than the conventional policy at the same control level. In Figure 8, relative outage is plotted for the given scenario against the overall usage of resources as they can be found in Figure 7. Compared with the conventional policy at the 40% of outage for an example, improvements of approximately 0.17, 0.15, and 0.14 point can be achieved by the proposed policy for the control L0, L1, and L2, respectively. Overall resource usage in the game-theory based approach. Operator-centric outage measure plotted against the mean resource usage found in Figure 7. When the mean traffic demand exceeds the number of the available resources, the overall throughput performance for the conventional policy starts to decrease according to the increase of the total offered traffic. 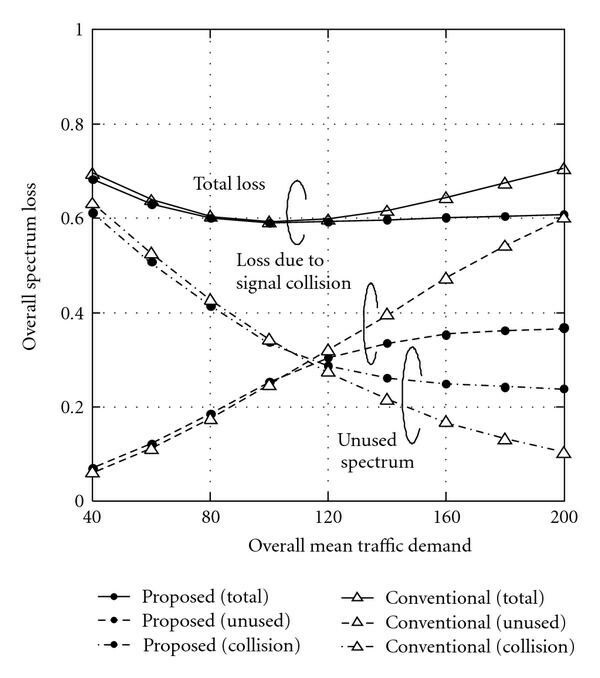 Figure 9 shows the performance of overall spectrum loss, which is the sum of the loss caused by the signal collision and unused spectrum, when L0 traffic control is assumed. As the overall mean traffic demand grows, the number of the signal collisions increases on a faster pace than the amount of unused spectrum decreases. This is because the conventional policy cannot take into account signal collision status for the transmission probability control. Assume that an operator could not acquire any resources although he tried to do so with the appropriate transmission probability. In this situation, he will increase his transmission probability, which will cause additional signal collisions and worsen the overall resource usage performance. This situation is a negative spiral in which collisions attract collisions. In the result, the amount of overall spectrum loss for the conventional policy achieves minimum when the traffic demand is 100. Overall spectrum loss performance is dominated by unused spectrum and signal collisions at mean traffic demands below and under 100, respectively. Overall spectrum loss performance in the game-theory based approach (the traffic estimation is based on control L0). The proposed policy however can take into account the amount of the spectrum loss caused by signal collisions. With it the user transmission probability decreases in accordance with the increase in the offered load to mitigate the degradation in the overall throughput performance caused by signal collision. Also as an outcome, the total loss amount for the proposed policy is lower than that of the conventional policy even for relatively high traffic demands. This performance improvement of overall resource usage is achieved at the cost of interoperator fairness, as illustrated in Figure 10. 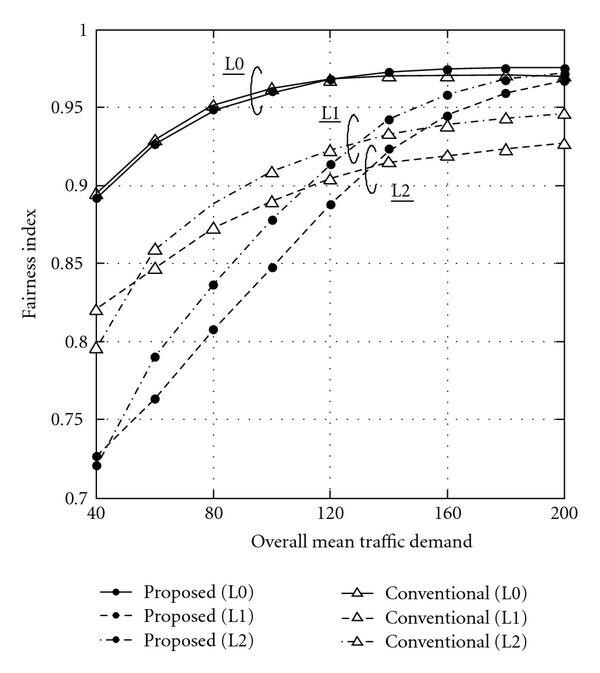 As for the proposed policy, it is shown that the more granular the control level is, the better fairness performance is, because of the increased estimation accuracy for the traffic demand. Also better fairness performance is achieved by the conventional policy regardless of the granularity of the control level and the total amount of offered traffic in the situation where the traffic demand is fewer than around 120. 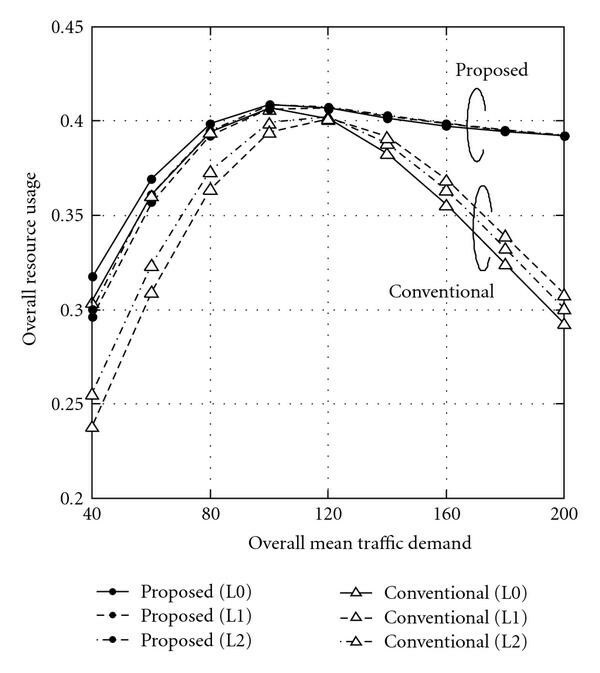 For higher traffic demands however, the performance for the proposed policy on all control levels is better than that for the conventional one. This is because the proposed policy can solve the negative spiral mentioned above by its transmission probability control according to the channel usage status, resulting in reducing the spectrum loss due to signal collisions and can make rooms to improve the fairness performance among operators. Inter-operator fairness performance in the game-theory based approach. The presented results show that the proposed policy rule allows operators with a relatively large demand to increase their transmission probability. That is, they prioritize the improvement in the overall throughput over interuser fairness when they recognize there is a chance to increase their throughput without harming others based on the proposed policy rule. As demand increase, signal collisions among operators occur more frequently. Thus, the amount of lost spectrum becomes large and the amount of the unused spectrum becomes small. In such a situation, the proposed policy encourages operators to prioritize interoperator fairness over total throughput improvement. Figure 7 shows that the overall throughput performance for the decentralized approach can be improved by employing the proposed policy. However, the maximum overall throughput is approximately 0.41 and there is still a big difference in performance compared to that of the centralized approach via spectrum trading. The main reason for this performance gap is that the decentralized approach achieves probabilistic spectrum sharing control. This sometimes results in misallocated shared spectrum so that signal collisions among operators are generated, leading to spectrum loss and unused spectra. This can be considered as a cost for decentralized control that enables scalable infrastructure construction, whereas negotiation cost for brokerage is needed for the centralized approach via spectrum trading that achieves deterministic spectrum allocation. In order to flexibly control the tradeoff of these costs, we propose a method for reducing the number of signal collisions by introducing a simple central negotiation mechanism suitable for the "spectrum pooling" concept. In the spectrum pooling concept, spectral ranges from different spectrum owners (military, trunked radio, etc.) are merged into a common pool so as to maximize the overall spectrum availability . Also, a negotiation mechanism among the operators that enables to temporarily rent spectral resources from other operators during their idle periods is considered in . Motivated by this spectrum pooling concept, the proposed hybrid approach consists of three phases with the framework of the centralized market hierarchy described in Section 3.2. On the hierarchic trading levels L1 and higher, that is, coarser ones, spectrum trading is held using the centralized approach presented in Section 3.2. After trading on L1, the operators compare the amount of resources they posses to their traffic demands estimated on the short-term level L0. Then they put the channels which are estimated unused into a spectrum pool. Finally, it is broadcasted which resource channels are in the pool (e.g., which channels are opened) to each operator. In the last step located on the bottom of the hierarchy, that is, at L0, only operators who want more channels join the spectrum sharing game over the resources from the pool using the policy described in Section 4. This approach is a centralized and decentralized hybrid approach. Centralized mechanisms are required to conduct the spectrum trading and to share operator channel usage information among them in phases (1) and (2), such as which channels are traded by which operators and which channels are available for the spectrum sharing game. Phase (3) can be implemented in a decentralized manner. In that way, spectrum trading costs are avoided on the fastest and most granular level L0 for the tradeoff of possible capacity losses due to signal collisions. 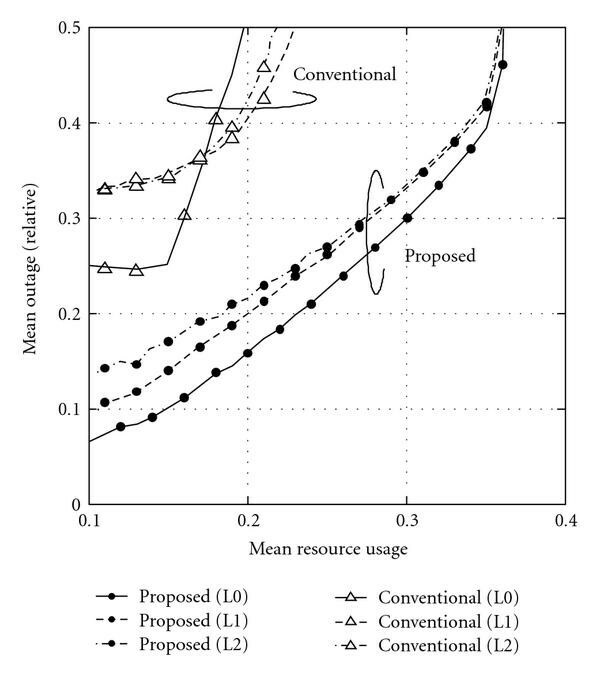 In Figure 11 an example of performance comparisons for resource usage among the centralized approach, the proposed decentralized approach and the hybrid approach is shown in the case that mean demand corresponds to the number of the available resources. Comparing the overall resource usage performance, the hybrid approach can drastically improve the overall throughput performance compared to the decentralized approach. One reason is that it can reduce the frequency of signal collisions by limiting the number of channels available for the spectrum sharing game and by reducing the number of operators participating in the game. However, as shown in the figure, a few signal collisions and a larger amount of unused spectrum still occur so that an approximate 0.1 points of performance degradation in the overall resource usage compared to the centralized approach remains. The advantage of the hybrid approach is that it does not need detailed information to identify the channel usage status one by one for each operator. It only needs to know which channels are opened or closed for the spectrum sharing game for the L0 control level. Thus, the hybrid approach is more flexible and scalable compared to the centralized approach. 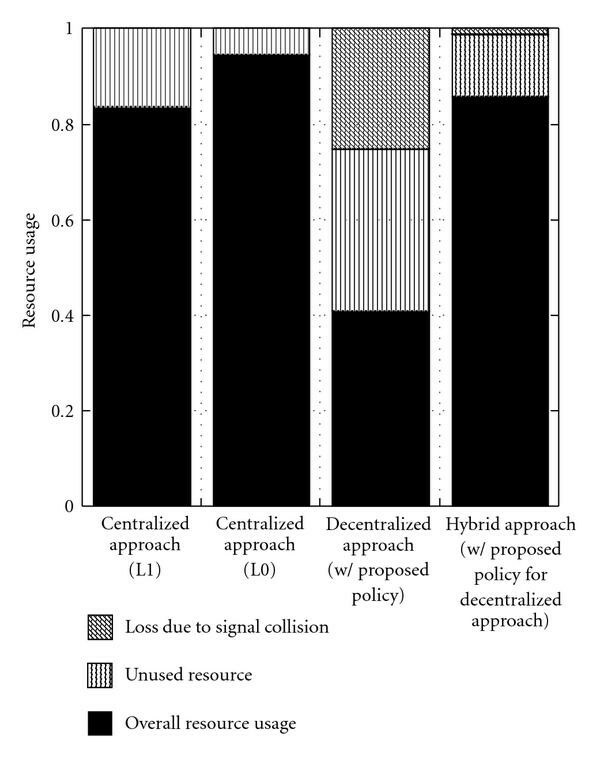 Performance comparisons of centralized, decentralized, and hybrid approach when the overall mean traffic demand equals the number of the available resources. In this way, the proposed hybrid approach can be positioned between the centralized and decentralized approaches considering the performance and flexibility viewpoints. It allows a flexible tradeoff between spectrum loss and central negotiation costs. We proposed a spectrum trading mechanism suited to spectrum sharing among wireless operators in a centralized manner, and a policy for decentralized spectrum sharing, which improves the overall throughput performance while considering fairness performance among operators. The proposed policy for the decentralized approach is based on game-theory and implemented as an adaptive transmit probability control algorithm. The proposals are evaluated by numerical simulations. The results show that the proposed centralized mechanism can absorb the peak traffic demand without any additional spectrum bands by introducing multilevel hierarchical resource trading among operators. Furthermore, the proposed policy for the decentralized approach improves the overall throughput performance taking into account interoperator fairness performance. The spectrum trading approach requires negotiation costs for spectrum brokerage to achieve efficient, flexible, and sustainable spectrum sharing, whereas nonnegligible amounts of spectrum are lost as the costs for the decentralized spectrum sharing approach. Thus, a hybrid approach of centralized and decentralized approach was considered to trade-off central negotiation costs and spectrum loss. Employing this control results in a reasonable overall throughput performance with lower negotiation costs compared to those for the centralized approach. The authors wish to thank the anonymous reviewers for their helpful comments. Their suggestions have significantly improved the quality of the paper.